This site is dedicated to Bazooka Joe and His Gang as depicted on bubble gum comics beginning in 1954. I began collecting Bazooka Joe Comics as a kid in the 1960s and continue to be a big fan of anything Bazooka. There are currently over 3,000 images scanned. Unless otherwise noted, all comics and images are from my personal collection. Click on any comic to see more detail. 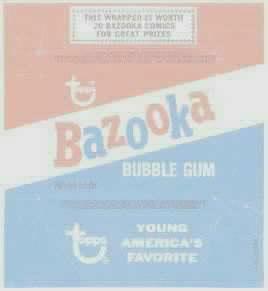 Bazooka is a registered trademark of the Topps Company, Inc.